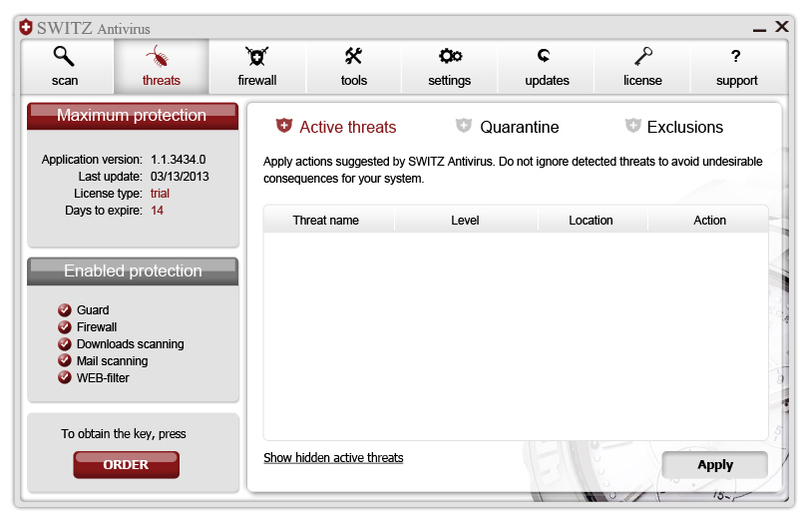 Still have any doubts about SWITZ Antivirus? More than 10 000 000 signatures in virus databases. SWITZ Antivirus protects Your PC from all types of malware (malicious software): viruses, trojans, worms, spyware, badware and other programs. 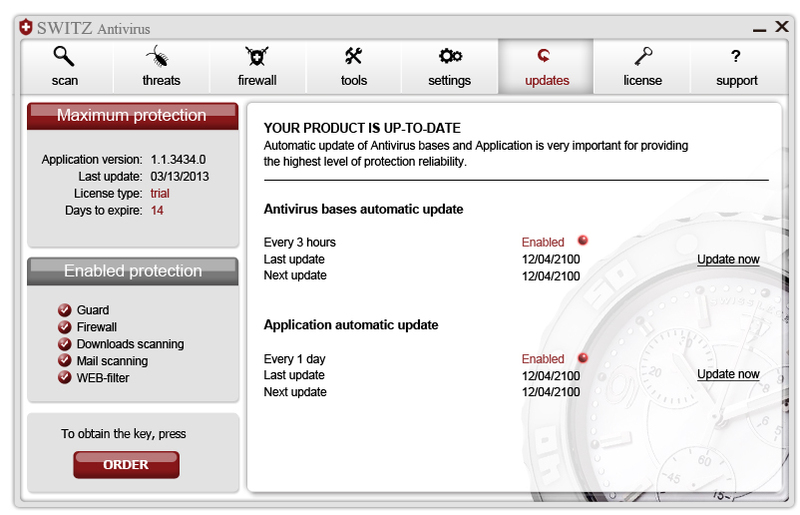 High efficiency of protection against malware – 65 000 new threats are added every day. 99% of work with virus databases is automated. Human factor exclusion makes the process of virus identification and neutralization faster and more secure. 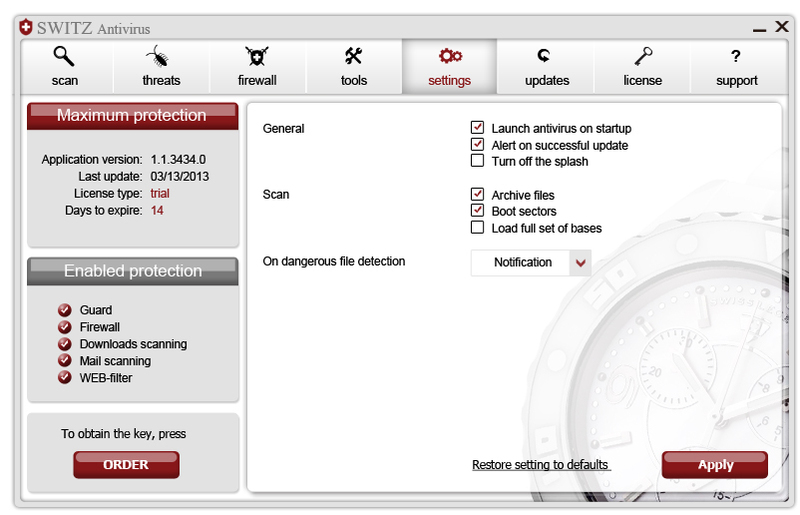 Guard system: constant scanning of running applications and files. SWITZ Antivirus monitors running applications and files, blocks/removes threats "on the fly" giving the malicious software NO CHANCE to cause undesirable consequences for Your system. Heuristic analyser: identifying viruses that are not listed in databases. 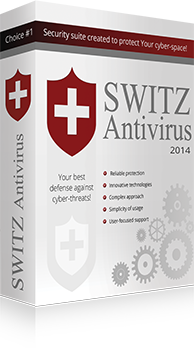 SWITZ Antivirus protects the system even from malware that is not included in databases. Low memory consumption of Your PC: SWITZ Antivirus technologies allow to make the consumption of system resources minimal. 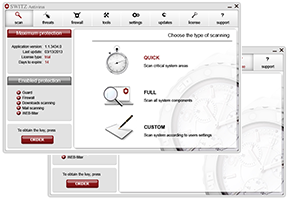 Three types of scanning: Full, Quick and Custom scans allow to check Your computer and system areas according to settings established by user. Mail and Web filtering: SWITZ Antivirus controls every possible way when the system can be infected with malware, especially E-Mail and websites. In case of finding infected E-Mails or dangerous websites, SWITZ Antivirus blocks them. Integrated firewall: SWITZ Antivirus controls network traffic on predetermined rules that could be set by customer. USB protection: automatic scanning of external storage. 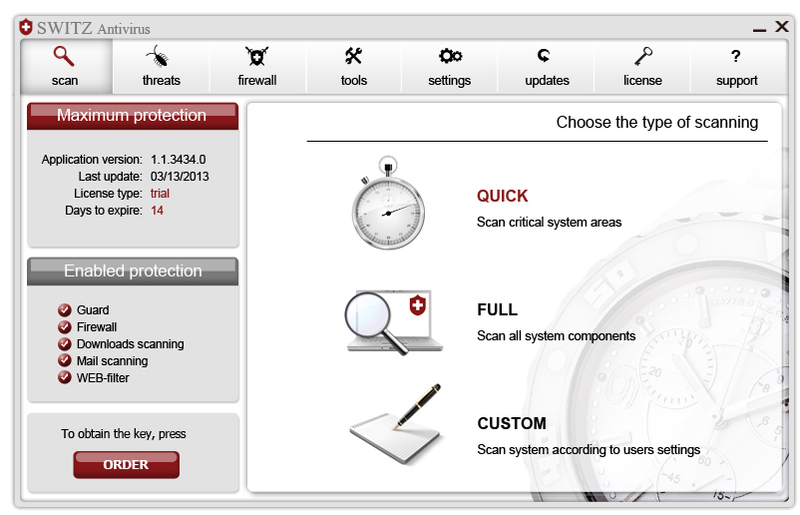 Optimal solution: SWITZ Antivirus always recommends an optimal action for every threat that was found. But anyway user can choose another action and apply it. Intuitive interface: SWITZ Antivirus has simple and friendly user interface for wide range of customers with different level of computer skills. Response to customer requests in 24/7 mode. SWITZ Antivirus is globally oriented, so instant and professional support is very important for us to make our clients sure, that we are client-oriented company. Ability to communicate with developers in social networks. 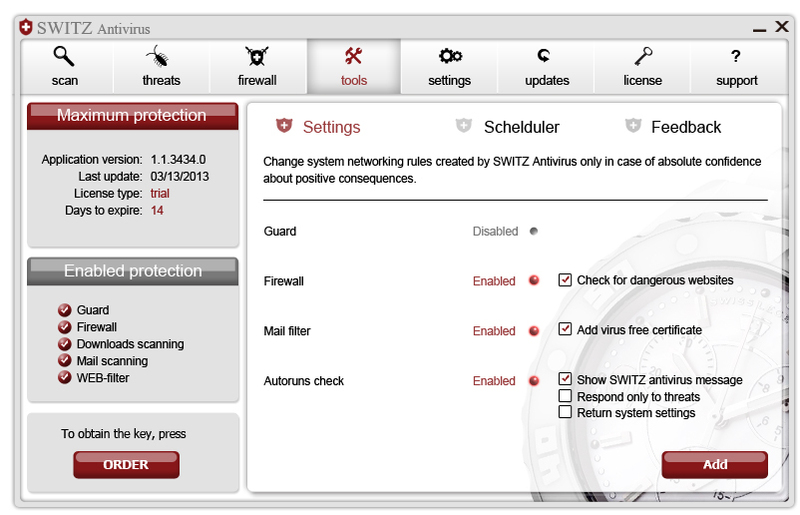 SWITZ Antivirus is an open project, and everyone can ask us about any details of using the product. Absence of embedded advertising and alerts that are not related to the protection of Your PC. SWITZ Antivirus is self-sufficient project and does not need to advertise anything to clients for becoming profitable. Our profit is generated only due to our IT-security solution. Opportunity to use the trial version of the program without losing functionality within two weeks – very important moment for our customers before making a purchase. System requirements allow to install antivirus on 90% of machines with different operating systems and hardware. Convenient payment methods for our users.